Home » General Health » Effects of Aging…or a Thyroid Problem? Effects of Aging…or a Thyroid Problem? What if aging isn’t the cause behind your gray hair and health issues? There are many symptoms of aging; there is no denying it. Even my seemingly ageless dad finally went gray. Sure, it took him almost 70 years to get there (and he’s still got more black hair than gray), but it did start happening. Nevertheless, although your hair color may change over time and you might not have as much energy or strength as you once did in your youth, it’s not always Father Time’s fault. In fact, if you’re experiencing a flurry of “aging” symptoms, it might not be due to old age at all. Your thyroid is a gland in your neck that produces hormones to regulate your metabolism. It’s extremely important to how your body functions and how you feel, and it needs to be running optimally to keep you strong. Sometimes your thyroid can slow down and not produce enough thyroid hormones. 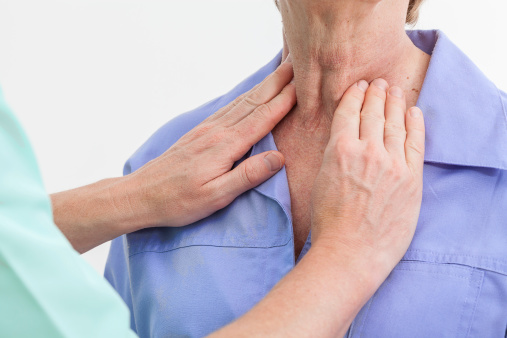 This condition is called hypothyroidism and it has a bunch of symptoms you can easily confuse with another illness, or simply attribute to old age. So if you’re feeling especially tired, have a hard time focusing, feel unmotivated or notice physical changes, like your hair and skin are getting thinner and dryer, or you’re experiencing more aches and pains, it might not be aging— it could be hypothyroidism. 1. Fatigue: If you feel unusually tired and have a lot less energy than normal, it could be a sign of hypothyroidism. Most people don’t just lose their energy out of nowhere, so unless you’ve made a major dietary change, or lifestyle adjustment, “old age” is likely not the cause. 2. Temperature: Another symptom of an underactive thyroid is sensitivity to cold. If you find that you are chilly and need a blanket or a coat when others in the room are warm or comfortable, it could be a warning sign. Check the thermometer, and if you’re heavily overdressed, you might want to contact your doctor. 3. Low Appetite, High-Weight: Because your thyroid slows down your metabolism, you’ll likely notice that you’re not as hungry—your body doesn’t need as many calories. Typically, this would result in losing weight, but because your metabolism is malfunctioning, you can actually gain weight on fewer calories. The limited calories you are consuming are more likely to be stored as fat, as opposed to when you’re healthy and your body is utilizing the calories to carry out regular functions. 4. Your Heart: Low levels of thyroid hormone can lead to high blood pressure and elevated levels of LDL cholesterol buildup on arterial walls. Because your body slows down, blood is not pumped effectively and it can lead to problems for your heart. Other symptoms include depression and memory lapses, so if you’re feeling unusually down, it can also be a cause for concern. Because every condition is different, it’s important to talk to your doctor if you think you have a thyroid condition. It is a severe health problem, and any treatments you try should be shared with your medical practitioner.